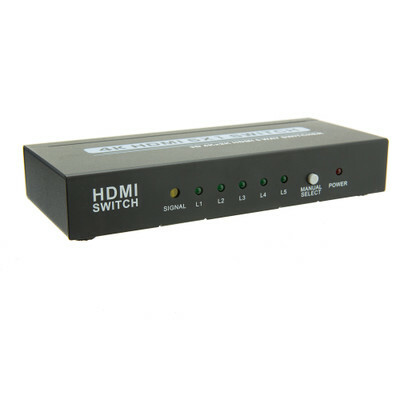 This HDMI switch will allow you to access up to 5 devices that use a high performance HDMI connection. This is the easiest way to expand your HDMI inputs into your Hi-Def television without the hassle of manually plugging in different HDMI connections to view different sources. At a touch of a button you can effortlessly switch any device connected with the included remote control. Plug-and-Play offers a quick install without any software. This switch also supports Ethernet-enabled HDMI cables. Expected unit to have IR extender as shown on spec sheet. But there was none and no IR port. Also the CR2025 Button cell was dead in the remote. Replaced with new one and unit is working fine. The only other thing is the LED indicators are Too Bright!